“Missing is just another way of remembering," Isha smiled back at him. “How can I do this, Ma?” moaned Hosh. "I could never cook like you. No one can cook like you." “I'll teach you about my secret spice box," said Isha, "and also give you recipes. Get stuff together as per Ingredient Lists and use the recipe to cook dishes in a jiffy." "You'd be amazed to see how quickly you can yourself start cooking simple global recipes fast and well, for cheap. It's easy." "Really?" Hosh was skeptical. "But there are so many spices?" "True," she laughed. "But even though there are more spices because of their combinations than there are varieties of plants, great cooking requires just a basic knowledge of a few master spices." "You'll learn from experience how temperature works on food, what makes a balanced nutritious diet, how you can use more organic produce in a reasonable budget, and which foods go or don’t go with others." "But to cook a healthy, tasty meal, you need no more than a passion to cook, a keen eye, and a give-it-a-go attitude." “We can make a start now if you want,” said Isha. "If I was allowed just one spice for all my cooking," Isha began, "I’d pick the magical cumin seeds. In Hindi, we call it Jira, but some pronounce it as Jeera, Zira, Zeera, Girah or even Geerah. It comes in two varieties - black and white, and both are widely used." "Cumin is also an essential ingredient in Curry Powder and Garam Masala. It can be used as a powder or seed, and is good with meat as well as vegetables." "Your Pa is always talking about his grandfather cooking yummy meals with plain old salt and chili, and just a hint of spices. I bet his granddad used just Garam Masala. If he could, you can too, can't you?" "It is an ancient spice, and has been prospering on the earth for at least the last 4,000 years. Seeds excavated at the Syrian site Tell ed-Der have been dated to the second millennium BC. Cumin even finds mention in the Bible, in both the Old Testament (Isaiah 28:27) and the New Testament (Matthew 23:23)." 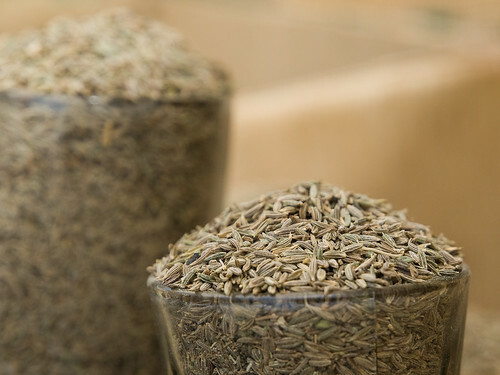 "I use Cumin as it is good for digestion and rich in Iron. Called Jirak in Sanskrit, it has been used in Ayurvedic decoctions for centuries. In the Ayurvedic system of medicine, it is known for enhancing appetite, taste perception, digestion, vision, strength, and lactation." "It is used to treat diseases like fever, loss of appetite, diarrhea, vomiting, abdominal distension, edema and puerperal disorders. Don’t worry about remembering all this, as this information can now be readily googled on the internet." "There are also many YouTube videos on its weight-loss and health benefits. But for now, just remember how it looks and feels and smells. Since we are already here in the kitchen, let's roast some. You'll be able to tell it’s roasted when it crackles and starts jumping in a hot pan in a minute or two." Isha put some Jira seeds on a hotplate and roasted them for a couple of minutes. Hosh loved the fragrance of roasted cumin seeds and the roasting technique seemed pretty straight-forward.